We also visited a farm that I’ve been obsessively following on the interwebs for many years now, Gathering Together Farm. Their blog is incredibly detailed and beautifully illustrated with photos that are both pretty and SO useful for a farm of our size. GTF farms about 50 acres of mixed produce, and partners with Wild Garden Seed, a seed growing operation that is the source for many of our most favorite things: lettuces, interesting mustard greens, kale, Delicata squash, sweet peppers, and so much more. Wild Garden Seed’s diverse offerings of seed variety has always been impressive, but much more so now that we have dabbled a little in seed production of our own. Anyway, we were too busy checking out GTF’s greenhouse designs, seed-starting facility, and packing station to take any photos, but their blog has it all – much better than any photos we could have taken with our little phone cameras. The climate in their part of Oregon is a bit milder than ours, and they are a few weeks ahead of us on their seed-starting schedule (spring!). They already had the first round of tomato seedlings up and growing, as well as chard, peas, onions, and a few other early crops. Although GTF has about 5 times more acreage in production than we do, the basics of their operation felt very familiar. It was both inspiring and reassuring to witness a farm operation that has been in business for 25 years and has lots of happy current and former employees, loyal customers, and owners that seem to still enjoy what they do. Back on our farm, the signs of spring are there too, although many of them are happening behind closed doors. The obvious signs are the glowing seed-starting room, with trays of just-germinated seedlings poking up, the noticeable increase in egg production by our small home flock, and the first little flush of weed seeds that broke out in the 30×90 greenhouse after we ran the sprinkler in it last week. 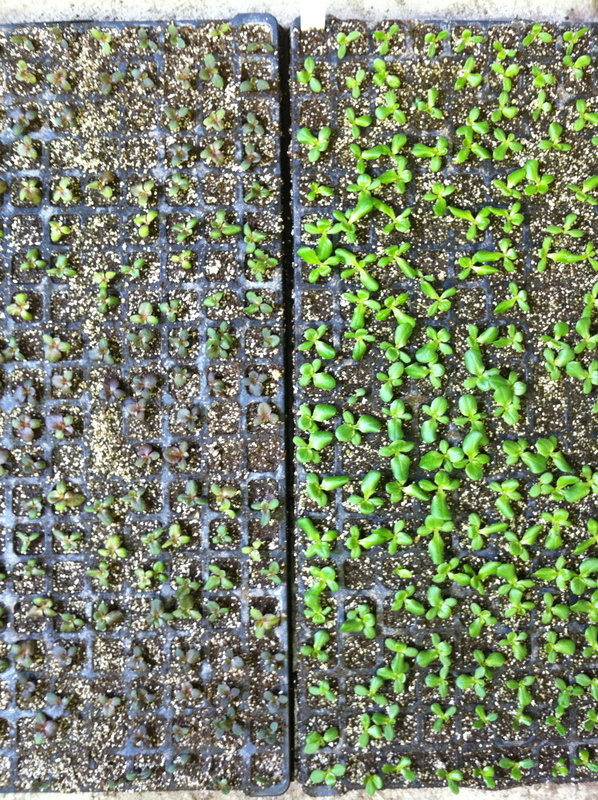 Two weeks ago, we seeded our first round of veggies to be transplanted into a greenhouse: 2400 baby lettuces of various varieties. They are growing happily under lights in our germination/seed starting room. 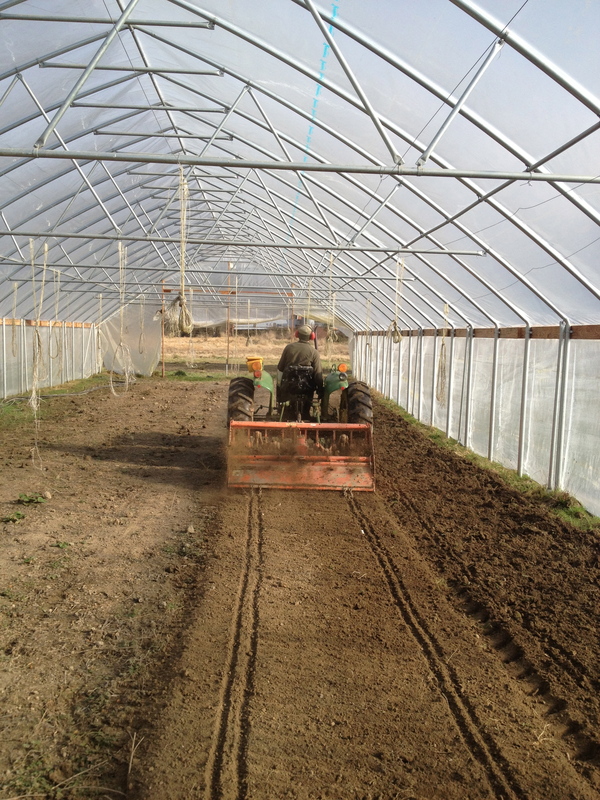 This week, we started 4800 Walla Walla onions, 2400 shallots, and 2400 cippollini onions. 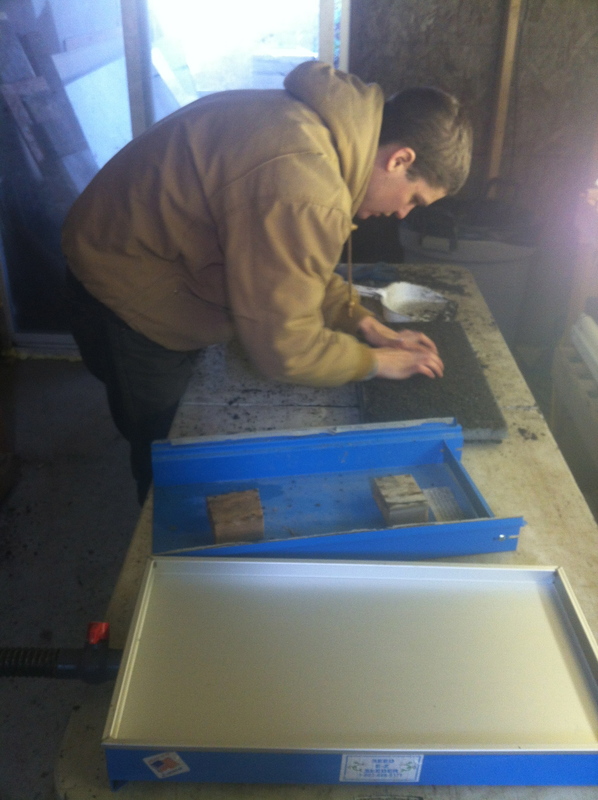 Today, we spaded some of our greenhouses, getting them ready to be planted with our first direct-sown crop of 2013 – radishes, spinach, and carrots. Then, we tried something new. 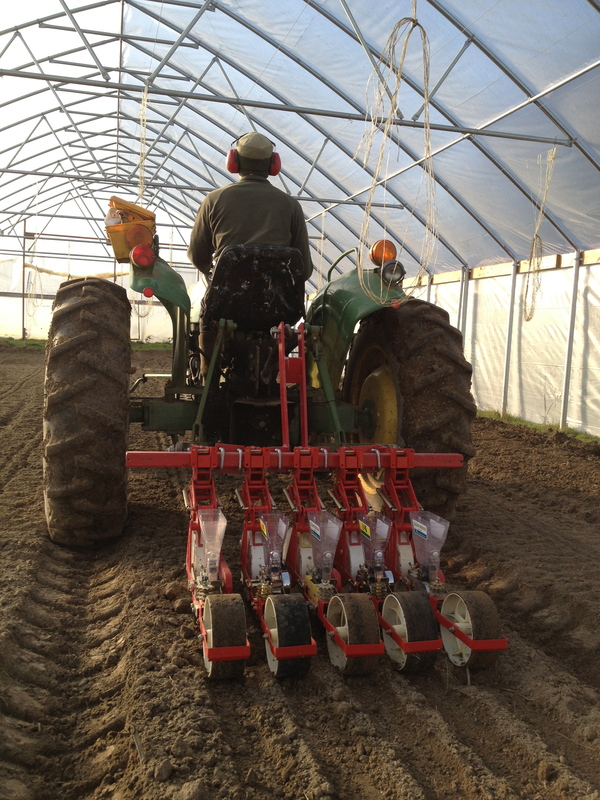 We used the tractor to seed radishes in the greenhouse (We’ve always used a one-row push seeder). The carrots and spinach, though, we seeded using the push seeder. 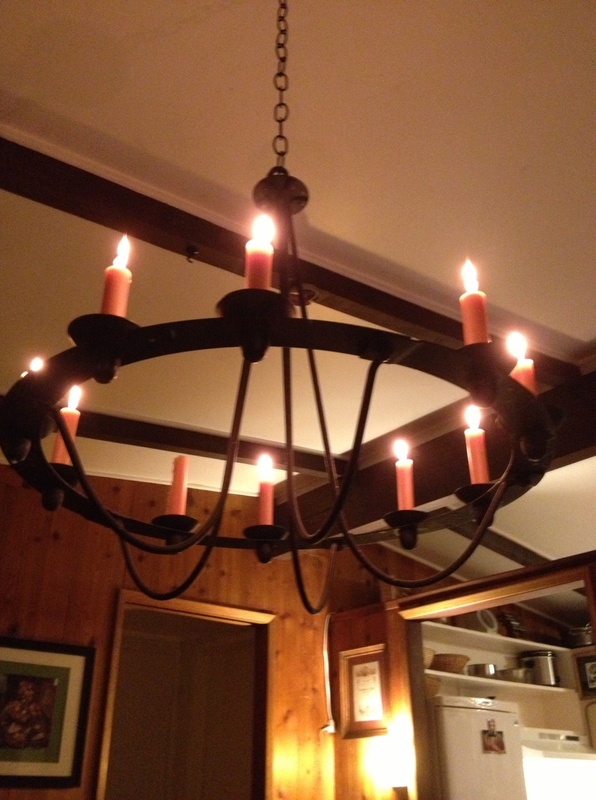 Last week, we finally finished fixing the above-mentioned spader. 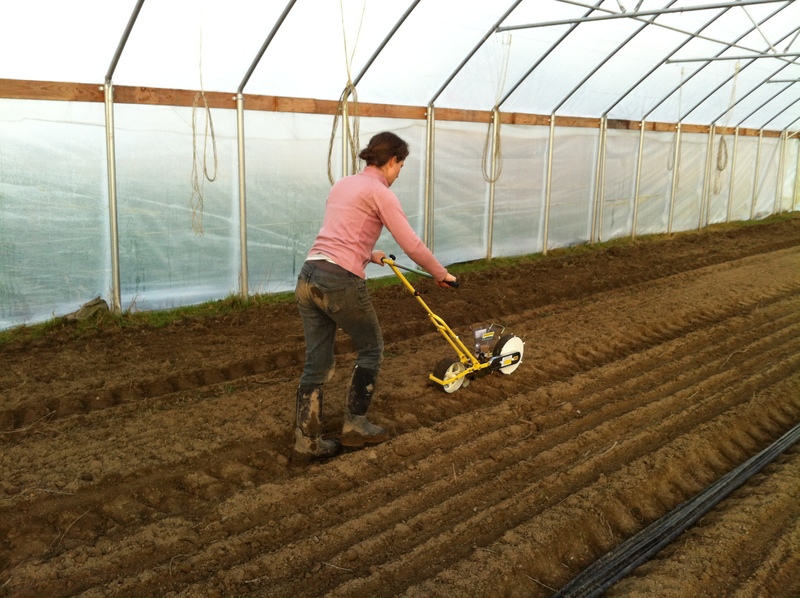 Spaders are amazing tools for small farms like ours. They do deep tillage work, loosening soil deep down and breaking up compaction, but they require but require a small fraction of the horse power required for traditional tools used for this task. A spader’s drawback is that is’s a finicky, complicated contraption that has a zillion moving parts, Zerk fittings to grease, bolts that can loosen, etc. We bought ours used, and towards the end of both 2011 and 2012, we had a bearing fail putting our spader out of commission before we were ready to stop using it. Last winter, we replaced some of the main bearings. This winter, we replaced all the rest. 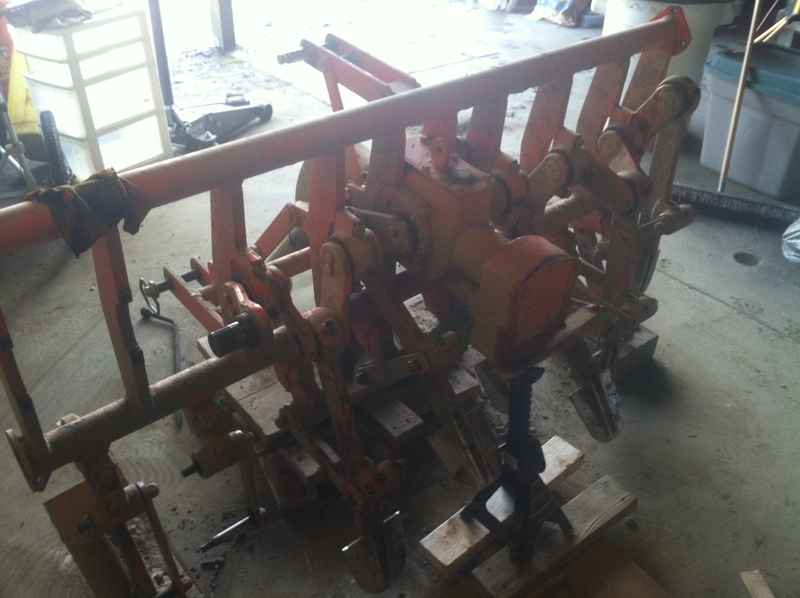 It’s an annoying job, but it’s finally done and hopefully will keep our spader working well for a few more years…. The winter and early-spring continue to be a whirlwind. Next week, we are being flown to Spokane, to speak at the annual convention of Northwest Farm Credit Services (click this link, our picture is front page on their website!!!). NWFCS is the bank that administers the Washington State Beginning Farmer loan program which is part of the complicated package of below-market-rate loans we got when we bought this place. The following week, we head back down to Oregon for the super-amazing, farmer-only Farmer to Farmer Exchange convention held at the Breitenbush Hot Springs at the base of Mt. Jefferson. By the time we get back, we hope to see some radish sprouts pushing their way through the soil in the greenhouse. Spring! Can you provide details about the pull behind seeder you used for planting the radishes? Sorry, I hit reply too soon. Basically, I was wondering if the seeder was self made or a commercially available unit? I’ve been looking for something like that. 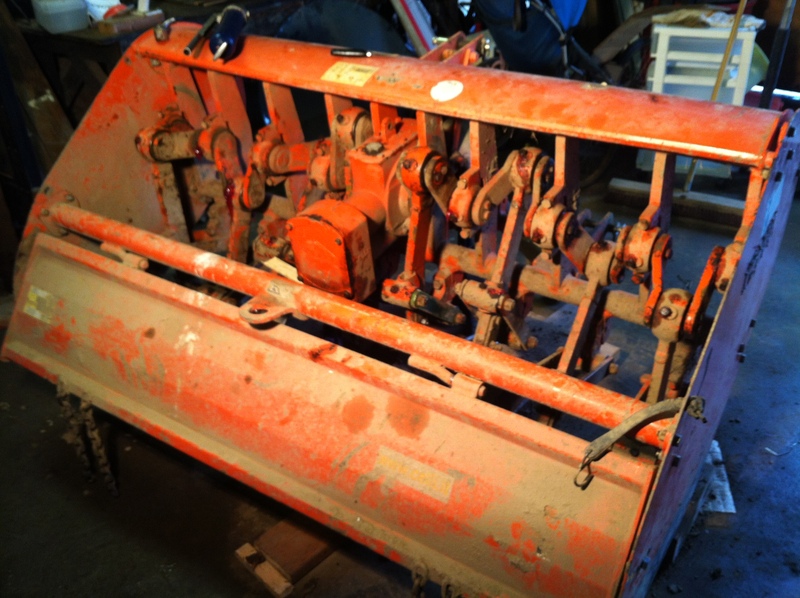 The seeder is commercially available through Mechanical Transplanter Company. It’s quite an amazing tool.